If coming from Dublin, Athlone,Galway or Mayo: Follow the main N4 road you are on, which goes through Sligo. You will see the blue Sunset building on the town side, literally on the corner between the N4 dual carriageway and the entrance to Sligo. This junction is S6. Turn right at this junction off the dual carriageway, immediate right again ( on to Adelaide Street ) and then right again ( in to the yard) to our car park / the building entrance. If coming from Donegal or Derry: Follow the main road you are on, which crosses the river. At the fourth set of traffic lights after the river, you will see the blue Sunset building on the left hand side of the dual carriageway, on a corner site. This is junction S6. Turn left and follow the arrows to drive around to the back of the building to access it / our free customer car park. 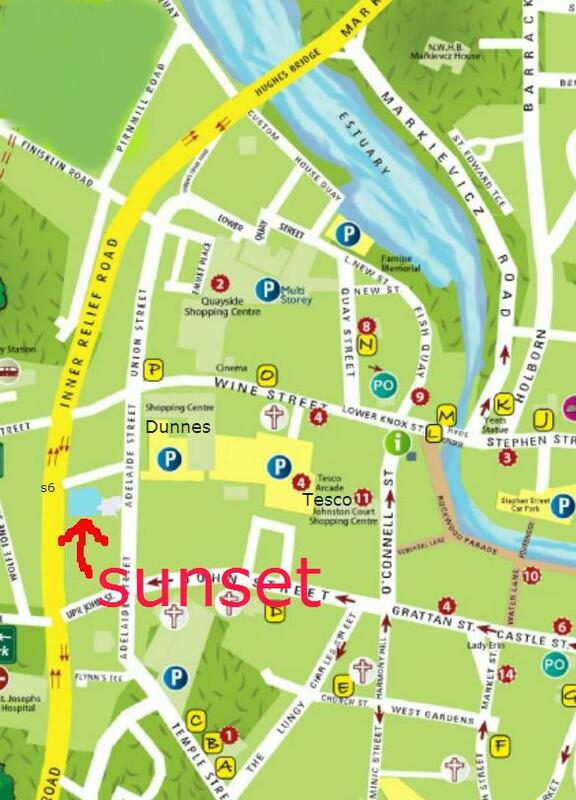 If coming from Strandhill: Sunset is on the Strandhill side of Sligo town center, and has free customer parking. As you approach Sligo, you will pass the bus + train station on your left. Turn right at the next set of traffic lights ( the ones which cross the main N4 dual carriageway ) and you will see the blue Sunset building on the corner site on the edge of the dual carriageway. ( this is signed as junction S6). Follow the arrow on the building to drive in around the back to our car park / the building entrance. If walking from the town center: We are only a minute or twos walk from the main car park ( the Tesco / Dunnes car park ) in the middle of town....simply walk from the Tesco in the direction of the Dunnes car park and in front of you is Adelaide Street. Turn left on to the street from the car park, walk 50 meters and our yard entrance and signs are on on the other side of the street.